Dave and I took the bikes over to my parent’s house last night. When we were leaving, my father’s motion detector went off and cast a neat glow on us as we were leaving the driveway. While waiting for my bike to warm up (blast you, carburetor), I looked down and laughed at myself. 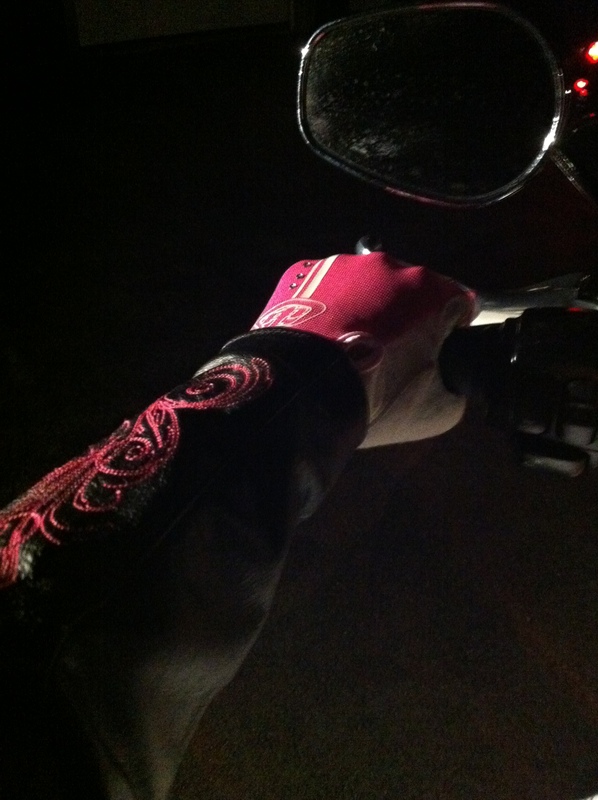 Pink and rhinestoned gloves, and a pink embroidered leather Harley jacket. This represents a few things. The pink and rhinestones represent me, my lighthearted girly fun loving self, the bike represents my freedom, and the actual items I am wearing represent all the hard work I’ve been putting in (anything Harley-Davidson = $$$). Just a neat scene I thought I’d share. Plus, I really liked the lighting. This to me equals happiness. < Previous Two Weddings and a Birthday! Hi, first time checking out your blog, but have to say that this post is very enthusiastic. Keep it up! Harley Love!